As previously reported by this site, North Carolina’s Attorney General and Gubernatorial candidate, Roy Cooper, was mentioned in the Democratic National Committee (DNC) emails leaked by WikiLeaks. In the previously reported emails, several DNC officials, who also provide event coordination via various companies for Democrat events, helped facilitate a meeting between Goldman Sachs employees and a top Obama Super PAC contributor. Roy Cooper’s name appears a second time in the leaked DNC emails. This time it is a fundraiser event hosted by a gay power couple in New York City. Richard – It was so great speaking today, thank you for making the time after what sounds like an absolutely incredible journey! Per our conversation, wanted to follow up on two counts. 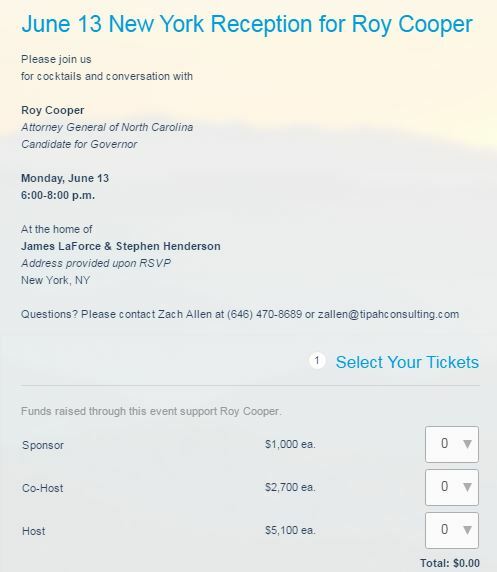 The event for NC AG Roy Cooper at James & Stephen’s is June 13th, and the details are attached and below. If you have any questions on that, please don’t hesitate to ask! We’d love your help spreading the word – this is an important race getting some national attention. If you’d like to join as a co-host, just let me know! Secondly, wanted to make sure you had the convention packages we discussed – you’ll find that information attached as well. With your contribution in 2015 of $33,400, you are halfway to qualifying for the Main Line package. If you’re interested in making a contribution this year, one can be made online at https://my.democrats.org/tristate2016. As I mentioned on the phone, while they are not 100% related, we do try and invite all of our maxout supporters to the holiday parties. Either way, I very much look forward to seeing you at James & Stephen’s, if not before! If you have any questions, call or email anytime! Read the full email via WikiLeaks. The couple mentioned in the email are Stephen Henderson and James LaForce. Henderson is a ‘free lance journalist’ who, according to a bio at HousingWorks.org, writes about “design, travel, food, science and religion”. LaForce is a “PR specialist” who launched his own PR firm earlier this year. For more information, view LaForce’s LinkedIn profile. Various outlets have done articles on the couple from the NY Times writing about the renovation of their Chelsea loft to Yale University’s Divinity school noting a large contribution of $50,000 for “LGBTQ scholarships”. The pair has also donated to numerous LGBT groups and funded multiple public LGBT projects such as the New York Public Library’s ‘LGBT at NYPL‘. In 2012, the couple was cited by Politico for hosting one of four fundraisers in New York City for President Obama’s re-election. The combination of the fundraisers yielded between $4 and $5 million dollars in donations. According to the Cooper campaign second quarter fundraising report, Stephen Henderson donated $2,000 to Cooper’s campaign on June 14th, 2016. Cooper’s second quarter financials reveal a large number of donations (around 217) on or around the same date. Over $8,800 in donations were recorded on June 13th with donors residing in New York. The email exchange containing the fundraiser details was between Zach Allen and Richard Christiansen of Chandelier Creative. Cooper’s second quarter fundraising report shows that Allen gave Cooper a $5 dollar donation. Christiansen is not found in the campaign records. As previously reported, Zachary Allen runs a company called TIPAH consulting, an event coordinating company formed in 2013. TIPAH shares the same address as MMW, run by Michael Kempner. Kempner is apparently the current Deputy Finance Director for the DNC. Zach Allen is the New York & Tri-State finance director for the DNC. Both Kempner and Allen report to Jordan Kaplan, National DNC Finance Director. According to Politico, Zach Allen became engaged to Josh Barro in 2015, citing having met at a Human Rights Campaign dinner in 2013. Barro wrote for the NY Times project, Upshot for less than a year before returning to his prior employer, Business Insider. This entry was posted in Campaign 2016, ELECTIONS, EXCLUSIVE, LGBT, LL1885, Pat McCrory and tagged #DNCleaks, Fundraising, James LaForce, Roy Cooper, Stephen Henderson, Zach Allen. Bookmark the permalink.